TenguLife: The curious guide to Japan: Nuclear power, earthquakes, tsunamis and the choices for Japan. And the planet. Nuclear power, earthquakes, tsunamis and the choices for Japan. And the planet. This blog is designed and deliberately written to be family friendly. As such, here, I don't tackle controversial subjects and don't aim to argue subjective points. I simply set out to explain interesting aspects of life in Japan. And following a couple of major earthquakes over the last few days which always re-ignites the debate, here we go on nuclear power…. Before the earthquake of March 2011, approximately 30% of Japan's electricity was generated by the nuclear industry. Soon after, all 100+ reactor cores were shut down for politically acceptable "maintenance". And since then Japan has been looking for an alternative. Scrambling that first summer the country brought older power stations out of mothballs, started to import vast quantities of oil and natural gas and even plugged two massive floating generators used for powering oil rigs into the Tokyo grid. Whilst renewables are obviously a good idea, the lack of power storage systems means they will remain marginal until that issue is resolved. Tidal power is beginning to develop, wind farms are progressing and even micro-hydro plants used in irrigation of rice fields are growing in popularity. But in reality major schemes such as terawatt hydroelectric damns (which produce significant greenhouse gasses through decay of foliage by the way) are years if not decades away. So the question is, do we continue to burn fossil fuels and risk the atmosphere, or do we switch the nuclear power back on and risk the land? Or alternatively do we switch off the lights and use less power? Tokyo after the quake. People switched off those lights to save power. 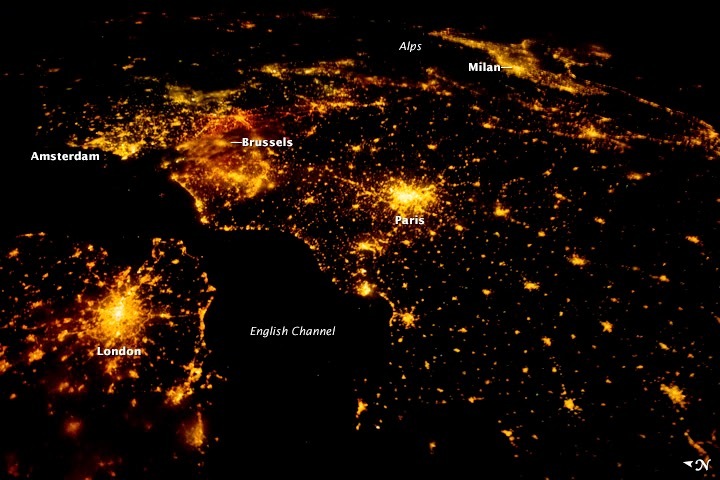 Europe at night. Does each light bulb have to be on?